Merci KriKri58 pour ton commentaire! Belles entrées. Certaines ont rejoint Probuscoins.fr merci ! Quant à la vente Jacquier !!!! Tout le monde est sur le pont ! ça va être chaud entre le spécialistes ! Salut! Voici une selection de mes nouvelles Probi. Tous les commentaires sont les bienvenus! 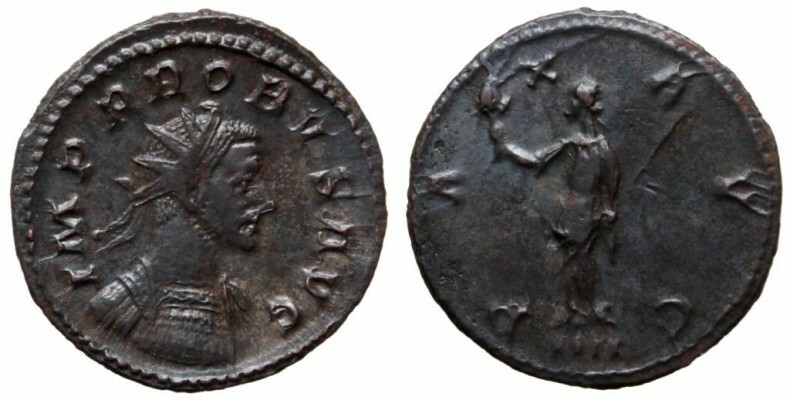 Note: A coin with a spectacular error in the obverse legend: POBVS (instead of PROBVS). 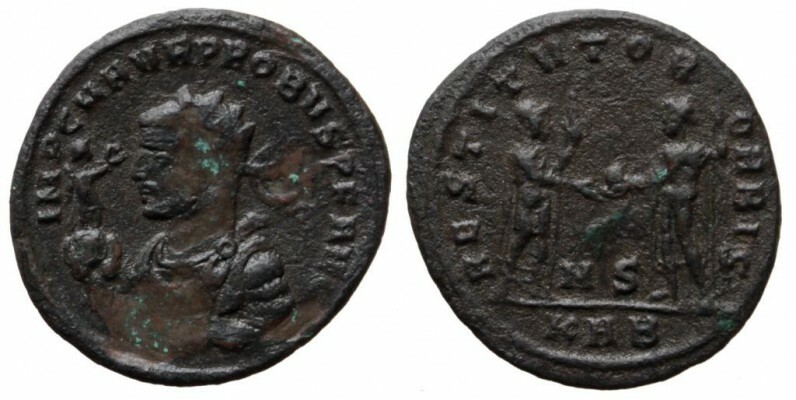 Not only is this the only example of this specific type known to me, but it is - to my knowledge - the only example of such an error in Emperor's name in the whole coinage of Probus. UNICUM! The coin is part of the very rare and brief A-Delta (without the KA mintmark) first phase of Serdica's 3rd emmission unlisted by RIC as well as by Pink. Although the exergue is barely legible, under a magnifying glass I see an "A" there rather than a Delta. 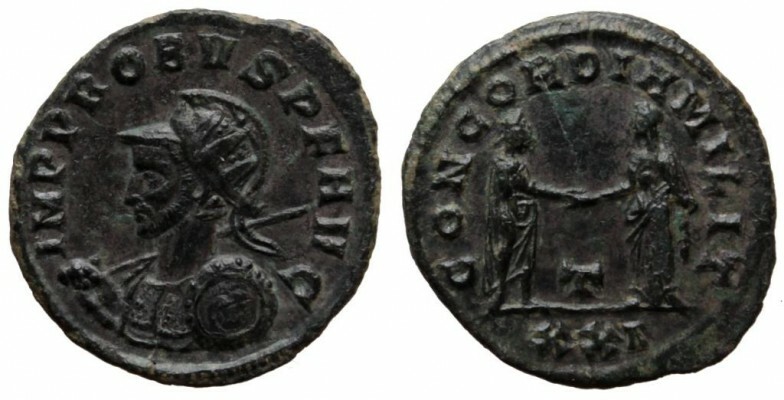 Nevertheless I will have the coin cleaned which hopefully will make the exergue more legible. 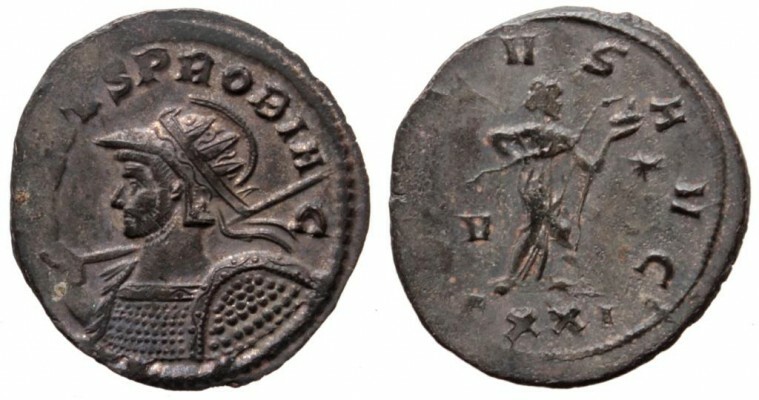 Unique and of the highest numismatic interest. The coin joins another interesting unicum with an erroneous obverse legend in my collection: PRBVS instead of PROBVS - see my coin no. 21 from Siscia. 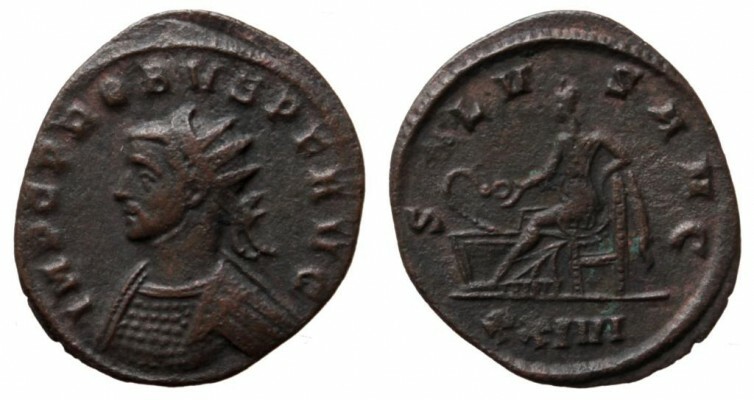 NOTE: THIS COIN IS PART OF THE CODED EQVITI SERIES (LETTER "V", i.e. third letter in the EQVITI word). Extremely rare bust type for Ticinum! VERY RARE AND DESIRABLE SHIELD TYPE ! Additionally, there seems to be a Gorgoneion inside the Parma shield !!! Spectacular, extremely rare and desirable bust type !!! THE ONLY EXAMPLE OF THIS EXACT TYPE KNOWN TO ME (and currently unlisted in probuscoins.fr) ! pour le partage de toutes ces raretés. Pour la n°4 de Serdica, tu es sûr du A à l'exergue, ça pourrait être Δ, ou rien? Un buste (drapé!) fantastique pour le n°11, est-ce qu'il existe pour d'autres ateliers que Serdica? Pour la n°4 de Serdica, tu es sûr du A à l'exergue, ça pourrait être Δ, ou rien? I am not 100% sure it is an "A" because of the relatively poor state of preservation of the exergue which is not easily legible. However, under a magnifying glass there clearly is a letter in the exergue (so we can exclude the possible variant with nothing in the exergue) and the shape of this letter does look more lika an "A" rather than Delta. So I would uphold my attribution to officina "A" with a 85-90% degree of certainty (leaving only circa 15%-10% probability for Delta). Pour la SOLI INVICTO, je suis d’accord, le A est plus probable. C’est bizarre, à l’avers le graveur a respecté un espace suffisant pour deux lettres. Dommage que S. Estiot n’ait pas posté la version à titulature correcte du trésor de Petrijanek.